Simple yet effective armour for the thigh and knee, the Steel Markward Full Leg Guards offer excellent protection on the battlefield. The steel leg armour consists of eight pieces fitted together, a design which grants great flexibility. 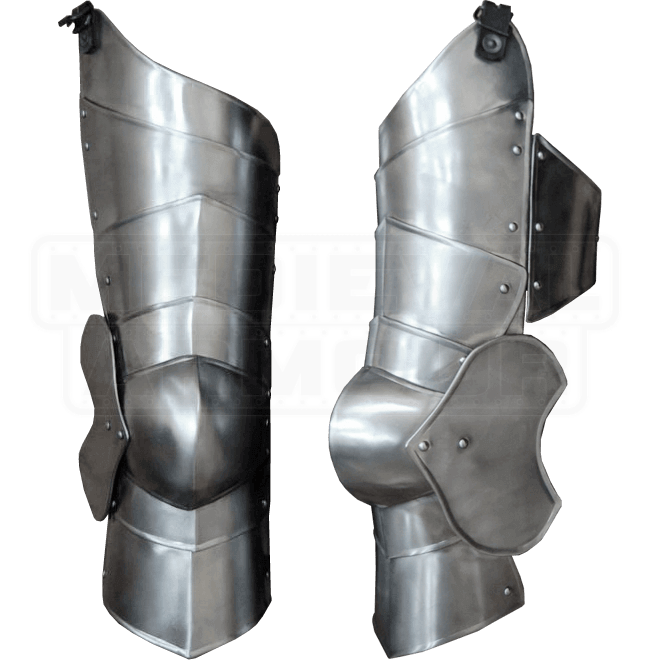 Perfect for LARPing, re-enactments, and the Renaissance fair, the leg protection boasts a bright metal finish that suits knights and warriors of all kinds. The plate armour is attached to the wearers waist using straps that can be adjusted to accommodate the leg length of the wearer. We recommend wearing padded arming wear underneath the leg guards for increased comfort. Be sure to check out our other Markward-style armour to create an entire warrior ensemble.